Things looked promising for SM Northwest early, as kick returner Jake Horner took the opening kickoff 65 yards deep into Lancer territory. The Cougars weren't able to cash in a touchdown, instead settling for a 32-yard field goal from Jorn Winkelmolen. That would be all the scoring SM Northwest would have on the night. SM East's Troy Wilkins took the ensuing kickoff 76-yards to the house, after initial bobbling the the ball. 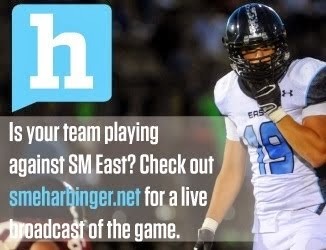 The game was 7-3, SM East, at halftime. In the third quarter SM East began to seperate themselves. They started with a 68-yard touchdown drive that lasted nine plays and ended with a one-yard touchdown run by Jeff Cole. They scored next when their quarterback, Dakota Collins, hit wide receiver Elliot Faerber on a five-yard touchdown pass to go up 21-3. SM East's final touchdown came on a 22-yard strike from Collins to Faerber midway through the fourth quarter. 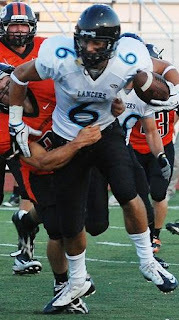 In his debut as quarterback, Collins completed 17 of 30 passes for 245 yards and two touchdowns for the Lancers. The Illinois-bound Faerber was a matchup nightmare for SM Northwest, as he hauled in two touchdown passes and seeemed to get open on nearly every pass play. Faerber is the real deal, he didn't even look like he was trying last night!!! Yeah, because Aurelius Benn (a WR from Illinois) was such a scrub. No real talent goes to Illinois (Rashard Mendenhall). one good play doesnt make you a play i know, but living up to your "hype" does. The kid is just preforming.